I've got to cover a whole bunch of different things to give updates to things that are in progress. 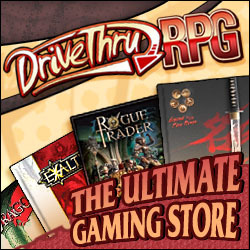 First off, this week is the Christmas in July Sale at DriveThruRPG. Melior Via is enthusiastically participating in it, and all of our products are 25% off as part of the sale. If you've been thinking about looking into our products, this is a great time to jump in whole hog. If you're looking for other gaming material, there's a stunning array of deeply discounted products included in this one. Fabled Environments is currently wrapping up a Kickstarter for a High School Floorplan. I think this is a fantastic idea and a great resource for anyone interested in gaming at a High School. In an effort to encourage folks to help them reach stretch goals, Melior Via has decided to offer a throw in. We'll be giving a free copy of the HPS Freshman Handbook eBook to anyone who pledges at the $40 level or higher. Finally, Accursed is continuing to make solid progress with our regular blog updates. If you're interested in a Savage Worlds setting where your the monsters are the heroes, please take a look. We love getting feedback.